As a bootstrapped start-up, we look to find as many ways as possible to save money whilst growing as quickly as possible. Over the past few months we’ve been growing by around 40% month on month, to a point where we are now processing in excess of 40m emails per week on behalf of our thousands of users. What’s our secret? There is no absolute secret to our growth, but we have discovered various ways of acquiring users at little to no cost. This one below is just one example of our many ‘growth-hacks’ up our sleeve. Doing the above doesn’t sound like rocket science, if someone is using a competitor, then they’re also a potential customer of yours. Often companies will use technology such as BuiltWith.com to discover who is using similar tools, however at a lowest price of $300 it can be a stretch for a small startup. 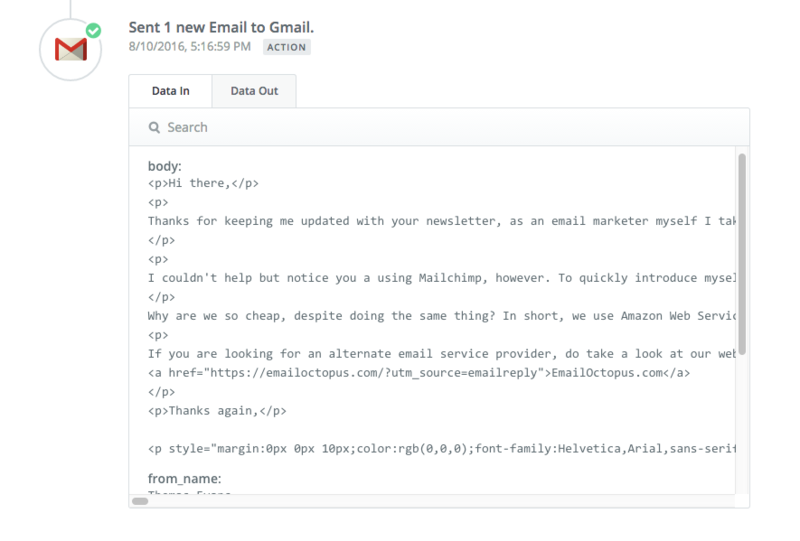 We opted to build our own fully automated outreach using Zapier and Gmail. Search Gmail, every 15 minutes, for emails which come from a competitors domain. For this we could have set up a ‘honeypot’ gmail account which we signed up to multiple addresses, however short on time we decided to connect multiple employees accounts who are already subscribed to numerous mailing lists. We used the search functionality for our Gmail, and searched for domains used by competitors. The one above is a Mailchimp example. Rather than emailing the user immediately, which would have been easier, we opted to add them first to a spreadsheet. Why? 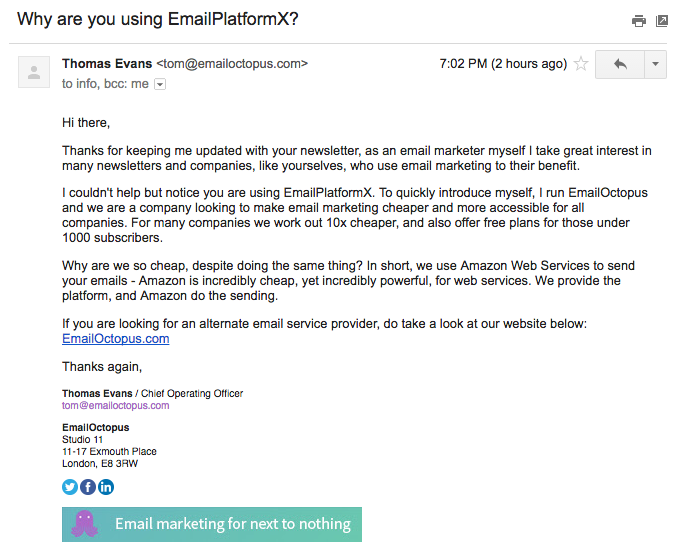 Firstly, we didn’t want to contact a potential customer via an automated email more than once. If you simply auto-replied to a potential customer everytime they sent out a campaign it would get a little repetitive, annoying and it definitely would not feel personal. We agreed to only contact them once using our Zapier automation. Secondly, by storing the data we can begin to build a database of our potential clients and the technology they’re using. Allowing us to contact them at a later date, and also chart the competitive landscape (most use Mailchimp, surprise surprise! ).We used the find/create row function in Zapier to do this. We’d search for the email address and from name collected on step one, if it was missing we’d add it to the spreadsheet, if it wasn’t present we wouldn’t. 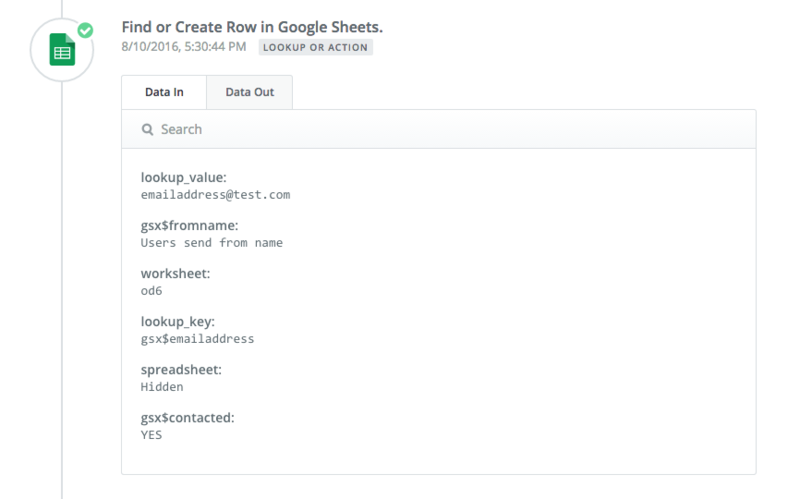 In step 3 we created a filter to stop users who had already been added to the spreadsheet from continuing down the automation track. This was really easy to set-up using default Zapier functionality, we just looked at the previous step and if Zapier had already found the data in the sheet then we stopped the automation. In this step we contacted users who had not been filtered out for the reasons above. We grabbed wrote some quick HTML, which made it appear as an almost plain text email with signature. We grabbed the email address from step 1 and added that to the ‘To:’ field. There’s always a next step to a Growth Hack, as they’re never perfect and can always be improved whether through further automation or by expanding it further afield. With this particular hack we’ll likely automate some of the signing up to mailing lists, allowing us to contact more newsletter senders. We’ll also look to reach out more personally to many of these potential clients, particularly as many will be sending from ‘noreply’ email addresses. As we store the email address, and therefore the websites domain, we can use a tool such as EmailHunter to contact individuals at the company. How can I apply this logic to my business? If you run a SaaS business, similar technology or ideas can be applied to your site. For example, if you run an A/B testing platform – you could run a TamperMonkey script in your browser which would run a piece of JS to submit a Google Form response with the URL every-time you browsed to a website which contained the Optimizely or Visual Website Optimizer script. Get in contact with us using the comments, and we’ll try to help you with a few similar ideas which may work for your business! I once tried zapier, but never got it working with some obscure services. How much response do you get from these mails?